Lepakshi is a small town in Anantapur district of Andhra Pradesh, India. 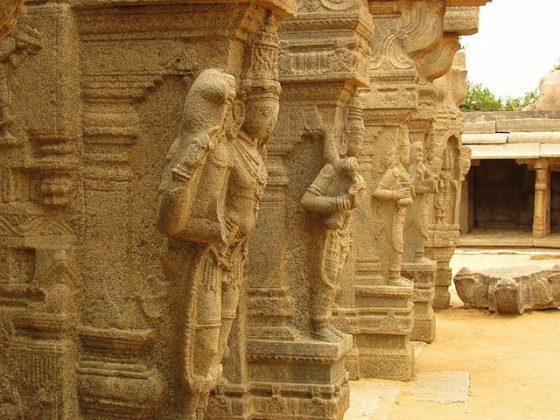 Town was built during the Vijayanagara period (1336–1646) and it is historically and archaeologically significant, with three shrines dedicated to Shiva, Vishnu and Veerabhadra. 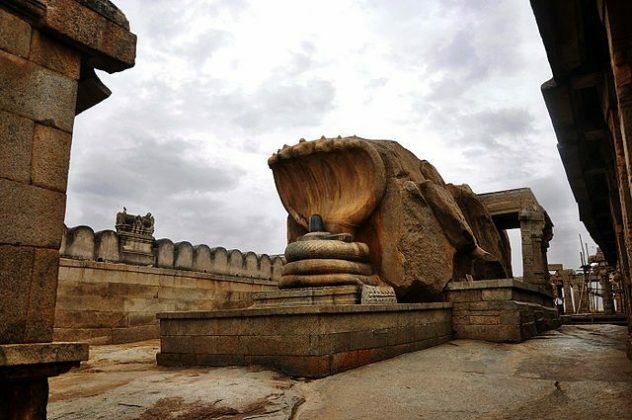 The most interesting thing about Lepakshi is its hanging pillar. 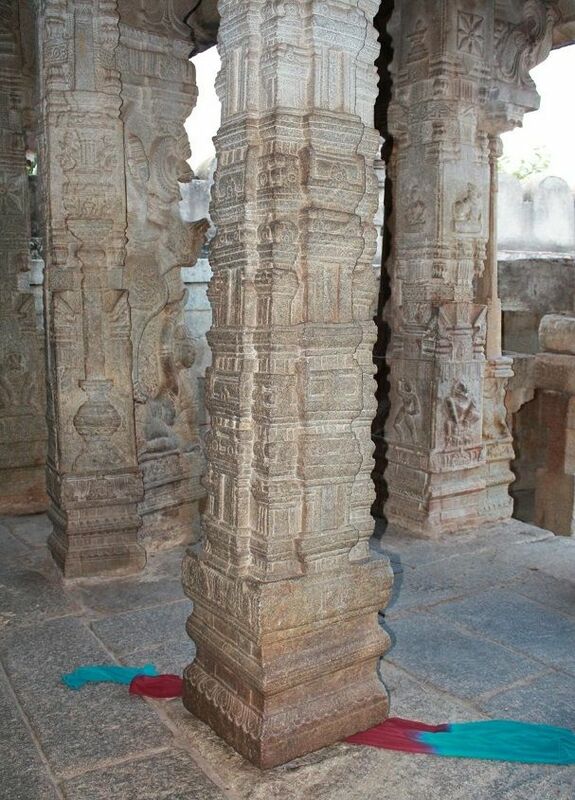 A pillar which is attached with the ceiling but not to the floor. One can easily swipe a piece of cloth or paper mid-air that separates the ground and the pillar. The pillar is at Veerabhadra temple and it is famous as Aakaasa Sthambha (floating pillar). 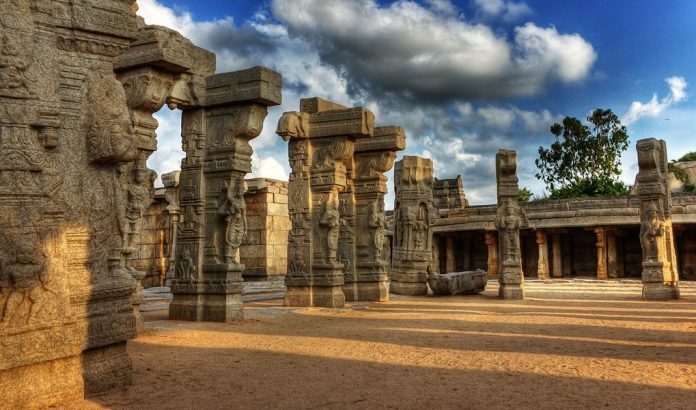 There are about 70 pillars at this fabulous temple of stone in Vijayanagar style, but this one is the best known and a tribute to the engineering genius of ancient and medieval India’s temple builders. 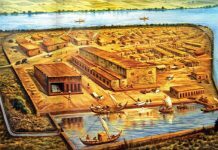 The 70 feet pillar is believed to have been dislodged by a British engineer who unsuccessfully tried to remove it to uncover the secret of its support. 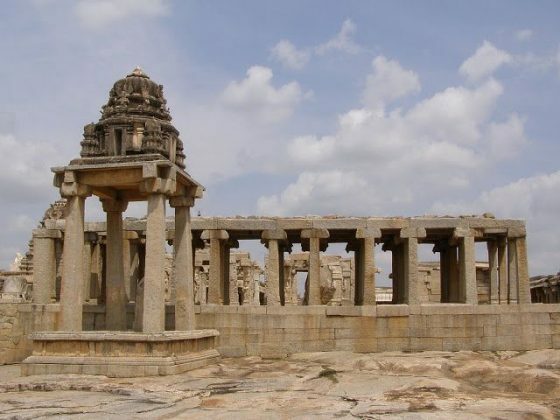 The Veerabhadra temple dates back to 1583 and was built by two brothers Virupanna and Veeranna, who were allies of the Vijayanagar empire. 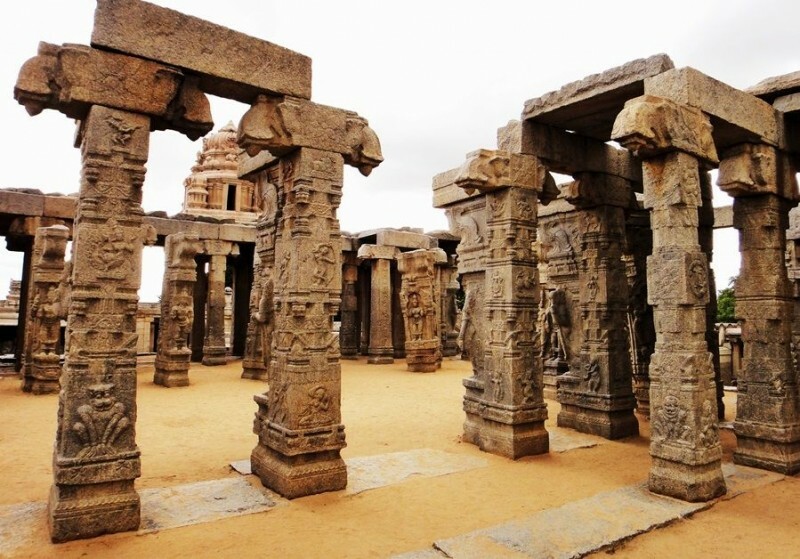 Temple is famous for its sculptures, which were created by the artisans of Vijayanagara empire. 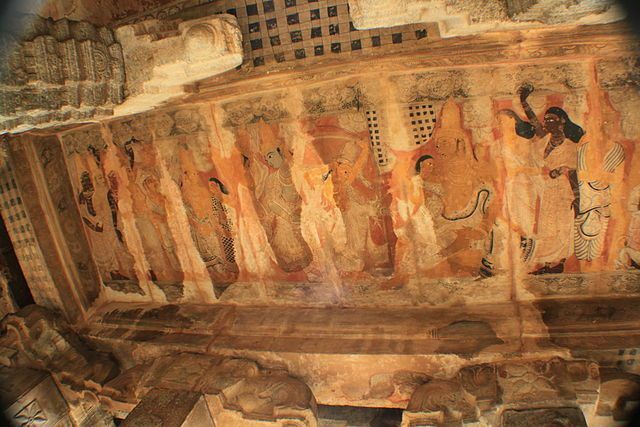 Lepakshi is also renowned for having one of the best collections of mural paintings from the Vijayanagar Kings period. Many old Kannada inscriptions dating back centuries can be seen on its walls. The inside of the temple is carved out of granite. The murals in the temple have been damaged due to prolonged exposure to vagaries of nature but still can be identified as depicting various stories like the marriage of Shiva with Parvati, wars, architects of the temple praying before Shiva, and many more. 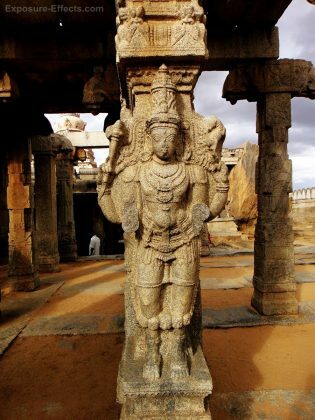 There are several forms of Shiva here — a majestic Kankala Murthi, Dakshinamurthi (Guru of Gurus), Tripuranthaka or Tripurasurasamhara (vanquisher of demon Tripura), Ardhanareeshwara (the half-female, half-male form, where Shiva and Parvati are equally represented in one body), etc. Another shrine has the fiery goddess Bhadrakali, though bearing an uncharacteristically serene expression. 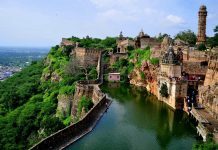 According to legends, the history of this place dates back to the Ramayana. 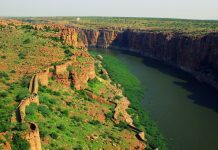 It was the site where Lord Ram’s faithful follower Jatayu fell down after having been injured mortally by Ravana, who was taking away Sita in his Vimana (flying chariot). Besides the Hanging Pillar, another draw is the spectacular Nandi bull made out of a single granite stone. At 27ft in length and 15ft in height, it is a colossal structure, reputedly India’s biggest monolithic Nandi. 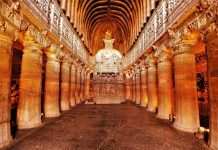 Besides the record size, the perfectly proportioned body, finely-carved ornaments, and smooth contours add to its grandeur and make it a popular photo-op with visitors. It has been positioned such that it faces the Shiva Linga shielded by a huge serpent inside the temple. 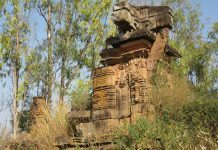 The huge Nagalinga or serpent with three coils and seven hoods can be seen cut out of granite rocks to create a breathtaking structure. 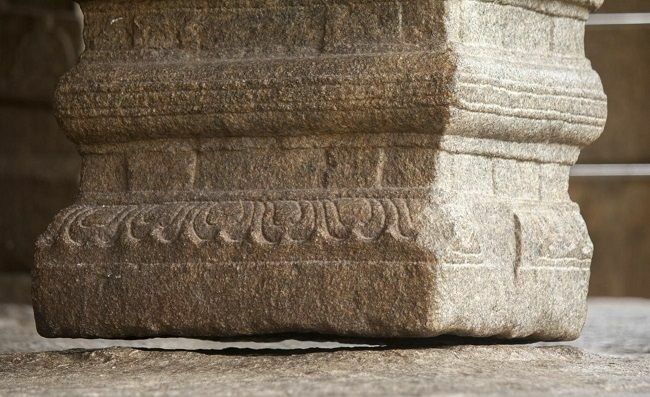 Here the Shiva Lingam is protected by the hood of the serpent and legend has it that the entire structure was carved out by a craftsman while his mother prepared lunch for him. It also has a sculpture of Ganesha.